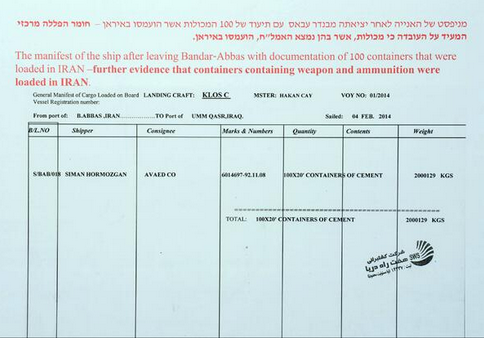 On March 10th a BBC producer made his way to Eilat to cover the story of the weapons shipment seized aboard the Klos-C as it was shown to the media the day after its arrival in Israel’s southern port. The report on that topic which appeared on the Middle East page of the BBC News website later that evening is notable for the fact that instead of fully and accurately informing BBC audiences about the details of the weapons shipment itself, it frames the story in very different terms. 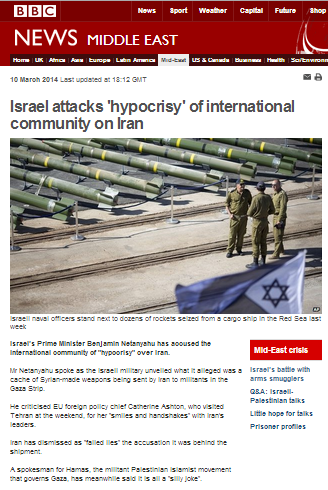 The article itself is titled “Israel attacks ‘hypocrisy’ of international community on Iran” and it opens with repetitions of the Iranian and Hamas propaganda previously touted by the BBC in earlier reports. 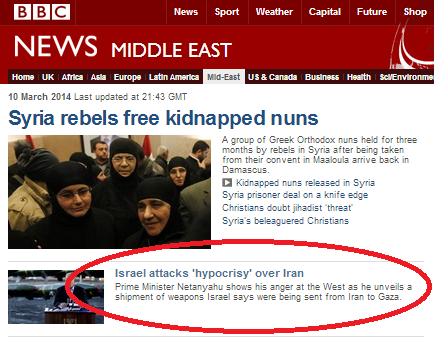 “Israel’s Prime Minister Benjamin Netanyahu has accused the international community of “hypocrisy” over Iran. Mr Netanyahu spoke as the Israeli military unveiled what it alleged was a cache of Syrian-made weapons being sent by Iran to militants in the Gaza Strip. He criticised EU foreign policy chief Catherine Ashton, who visited Tehran at the weekend, for her “smiles and handshakes” with Iran’s leaders. Iran has dismissed as “failed lies” the accusation it was behind the shipment. The factual information provided to reporters at the event was condensed by the BBC into two short paragraphs, the wording of which is quite remarkable when one considers that at least one BBC employee saw the forty 302 mm missiles, the 181 Iranian-manufactured 120 mm mortar shells and the 400,000 7.62 mm calibre bullets seized aboard the Klos-C with his own eyes. 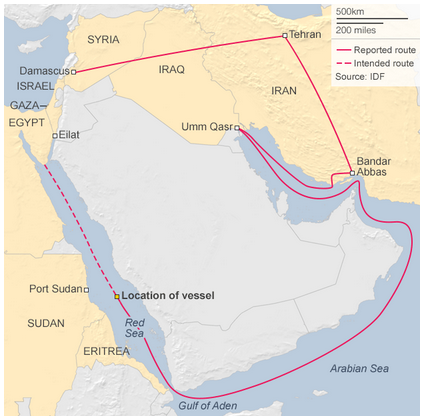 “Israel’s navy seized a Panamanian-flagged vessel, the Klos-C, in the Red Sea off Sudan last Wednesday, and said it was carrying dozens of M-302 rockets, which have a range of 150km to 200km (93-124 miles). Significantly, BBC audiences are kept entirely in the dark with regard to the information provided to the press which shows that the weapons shipment did indeed come from Iran. 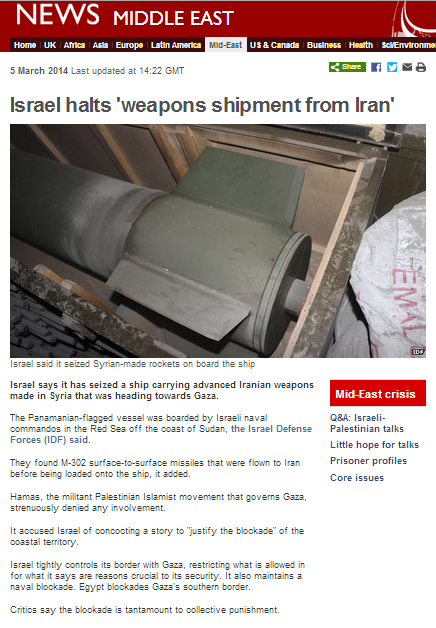 The fact that the shipment included Iranian-produced mortars is disappeared entirely from the BBC’s report. 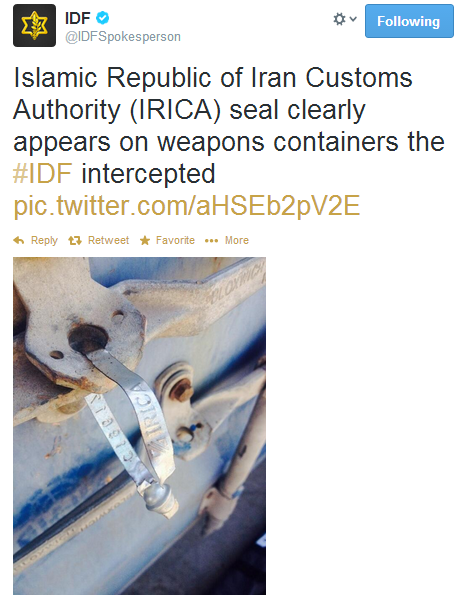 The fact that the weapons were concealed under bags of cement marked as being made in Iran and that the containers carrying the arms had unique seals used by the Iranian customs authorities is also not mentioned. 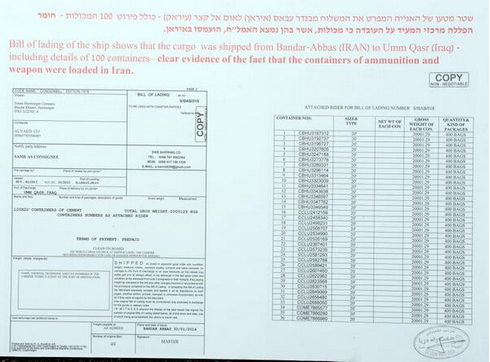 Reporters were also shown the Klos-C’s paperwork which indicates that 100 numbered containers – including those carrying the weapons – were loaded at the Iranian port of Bandar Abbas (click on the links to see the documents). 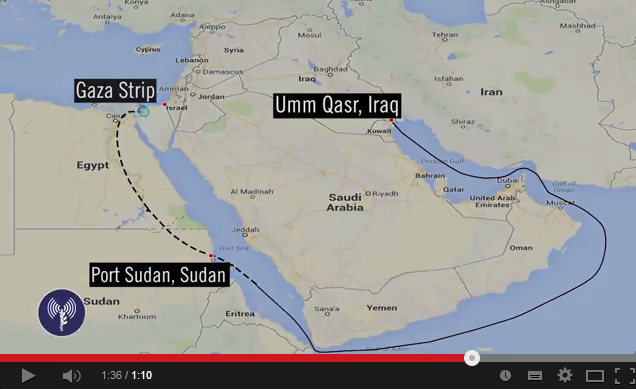 The ship then sailed to Umm Qasr in Iraq, where a further 50 containers were loaded. 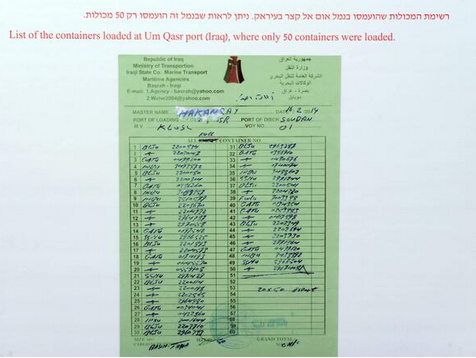 The ship’s manifest was then altered manually to create the false impression that all 150 containers – including those carrying weapons – had been loaded in Iraq. The BBC, however, has elected to censor all that information and continues to encourage audiences to view the story in terms of competing Israeli and Iranian claims by means of unquestioned promotion of the latter’s propaganda and liberal use of phrases such as “Israel says” and “Israel alleged”. The rest of the BBC report is devoted to remarks made by the Israeli prime minister at the press conference, with the curious inclusion of a video showing an interview with the EU’s Catherine Ashton during her recent visit to Iran and a link to a previous BBC report from Iran by Lyse Doucet. 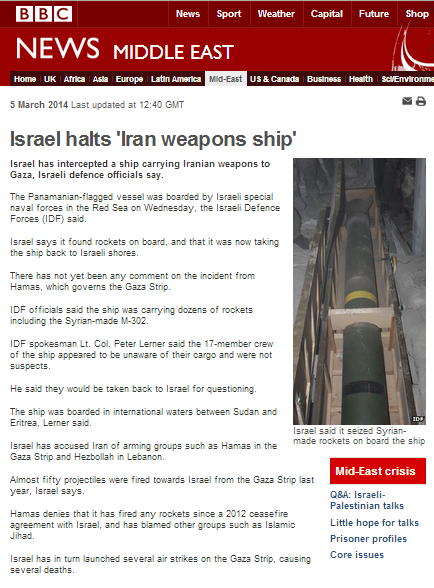 The fact that this BBC report conceals crucial information, and instead seeks to turn readers’ attentions to a version framing the Israeli prime minister’s remarks as the story’s focus, of course actively hinders BBC audiences’ ability to form their own fact-based opinions on the subject of Iran’s policy of arming and financing terrorist organisations in the Middle East and further afield and the implications of that in relation to the ongoing P5+1 negotiations on Iran’s nuclear programme. Sadly for BBC audiences however, there is nothing novel about that. 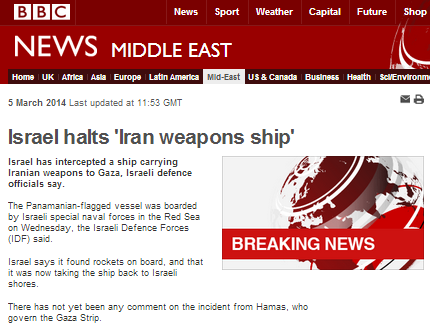 Since this story first broke, the BBC’s coverage of it has been notable in that it has consistently tried to distract audiences’ attention from the actual issue of Iranian arms shipments to terrorist organisations by reframing the story to focus on the Gaza Strip, on Iranian denials of involvement and now on the Israeli prime minister’s “anger”. By repeatedly reframing the story and by deliberately omitting crucial information it had at its disposal, the BBC has clearly breached its own editorial guidelines on accuracy and impartiality and failed to meet its public purpose of building “a global understanding of international issues”. 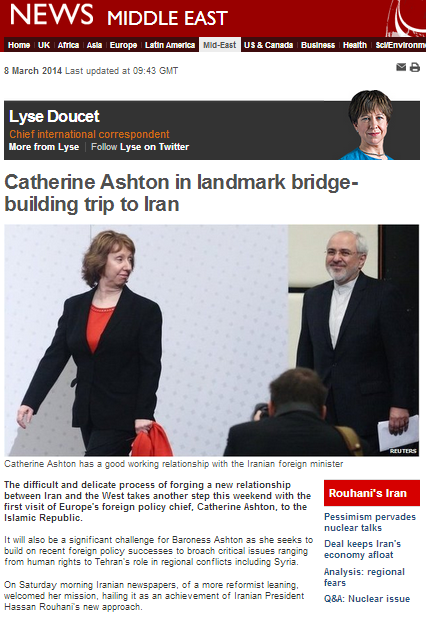 On March 8th an article currently running under the title “Catherine Ashton in landmark bridge-building trip to Iran” appeared in the Features & Analysis section of the BBC News website’s Middle East page. The subject matter of the report – which was written by the BBC’s chief international correspondent Lyse Doucet – is as expressed in its latest headline: a visit to Iran by the EU’s foreign affairs representative. 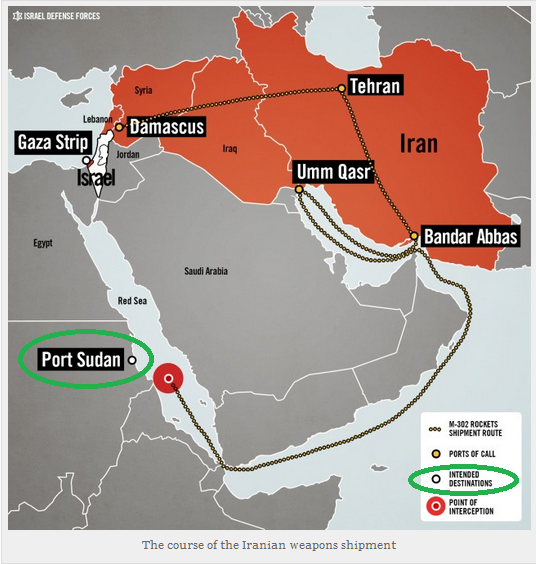 Doucet’s report does not at any point relate to the incident last week in which a ship sailing from Iran to Sudan was seized by Israeli naval forces in the Red Sea due to its carrying Syrian-made missiles destined for terror groups in the Gaza Strip. Hence the gratuitous inclusion of this photograph and its context-free caption can only be seen as yet more promotion of Iranian propaganda on the part of the BBC. The terms of the BBC’s constitutional document commit the corporation to building “a global understanding of international issues” and enabling “individuals to participate in the global debate on significant international issues”. 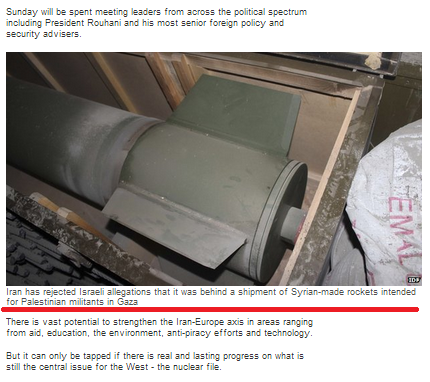 Although the BBC has shown no qualms about repeating and amplifying Iran’s propaganda on this topic, it has made no attempt whatsoever to justify that promotion with any sort of independently verified factual information which would support the notion that the Syrian-made missiles did not arrive in Tehran from Damascus and were not transported from there to the port of Bandar Abbas with the knowledge of the Iranian regime. Instead, it seems that the BBC is of the opinion that all audiences need to know is that “Iran has rejected Israeli allegations” (with the use of that last word being highly significant). Whether or not there is any evidence to support that “rejection” is apparently deemed superfluous to audiences’ “understanding of international issues”, meaning that not only is their ability to participate in the “debate” on Iran’s long record of arming and financing terrorist organisations constrained, but so is their awareness of the fact that such an issue exists. Consider this: on March 6th the foreign minister of Iran, Javad Zarif, put out the following chronologically challenged propaganda on Twitter. 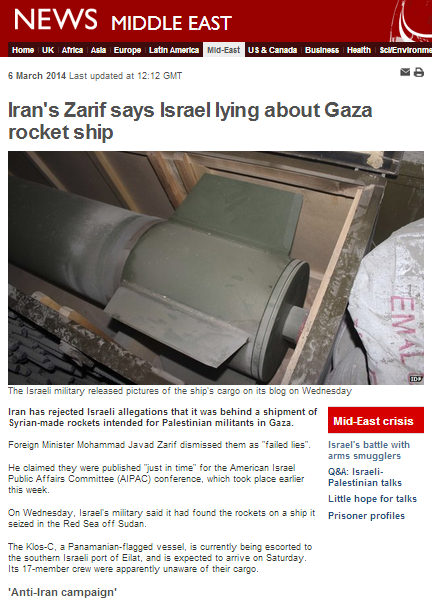 Within hours of Zarif’s finger having hit the ‘Tweet’ button (a privilege of course not afforded to the vast majority of his countrymen), the BBC News website had published an article based on that ‘140 characters or less’ agitprop under the none too subtle headline “Iran’s Zarif says Israel lying about Gaza rocket ship” – and thrown in a bit more Hamas propaganda for good measure. “Iran has rejected Israeli allegations that it was behind a shipment of Syrian-made rockets intended for Palestinian militants in Gaza. 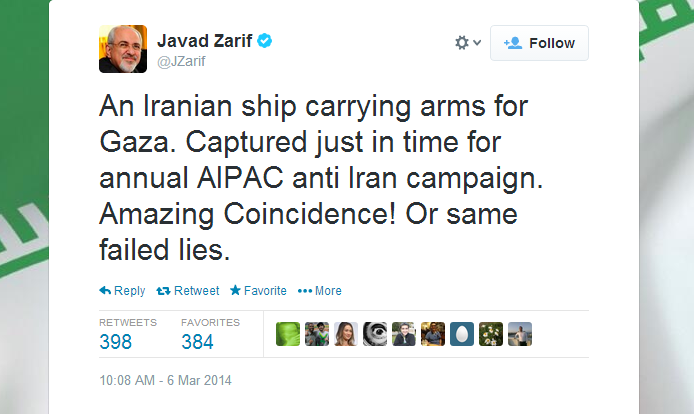 Foreign Minister Mohammad Javad Zarif dismissed them as “failed lies”. “On Thursday, Mr Zarif rejected the allegations and questioned why they had surfaced just after the conference a pro-Israel US lobby group. 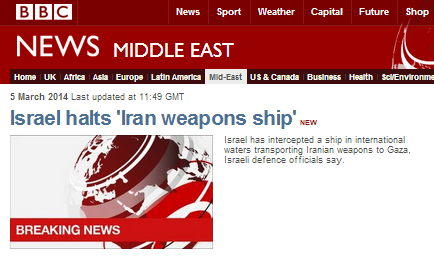 The article then duplicates the statement made in the BBC’s previous reports on the subject of the seizure of Syrian-made weapons on a ship sailing from Iran to Sudan, which deliberately misleads BBC audiences by creating the impression that Iran’s well-documented funding and arming of numerous terrorist organisations is nothing more than an Israeli claim. The report also reproduces the previously touted notion of equivalence between the actions of terrorist organisations targeting civilians and the responses to those attacks by the armed forces of a sovereign country charged with defending its citizens. “More than 60 rockets fired from the Gaza Strip have hit Israel since the start of last year, Israel says. Despite the ample readily available contradictory evidence, the article repeats the BBC’s frequent promotion of Iranian claims regarding the nature of its nuclear programme. So just what was the point of this BBC report? No new information is provided to readers on the topic of the seizure of the missiles itself and the article’s sole purpose appears to be amplification of Javad Zarif’s straw-clutching propaganda along with a re-run of Hamas comments of the same genre and repetition of the same misleading ‘smoke and mirrors’ focus on the Gaza Strip which detracts audience attention from the real issue at hand – Iran’s long and continuing history of material support for terrorist organisations. Considering that Iran was scheduled to receive a further $550 million in sanctions relief the day after the publication of this BBC report, this would have been a timely opportunity to inform audiences of the facts behind the extent of that country’s enabling of the internationally designated terrorist organisations which destabilize the Middle East. If members of the general public wish to immerse themselves in undiluted and unchallenged Iranian propaganda, they can of course do that via several official or semi-official Iranian media outlets. The remit of the BBC is not to be Press TV’s ‘Mini Me’, but to provide its audiences with the kind of accurate information which will enable them to distinguish between the propaganda of a repressive, theocratic, terror-enabling regime and the actual facts behind a story. Sadly, the BBC seems intent upon rendering itself irrelevant to discerning news seekers by repeatedly running interference for the Iranian regime with uncritical amplification of its propaganda – at least when that propaganda can somehow be linked to Israel. 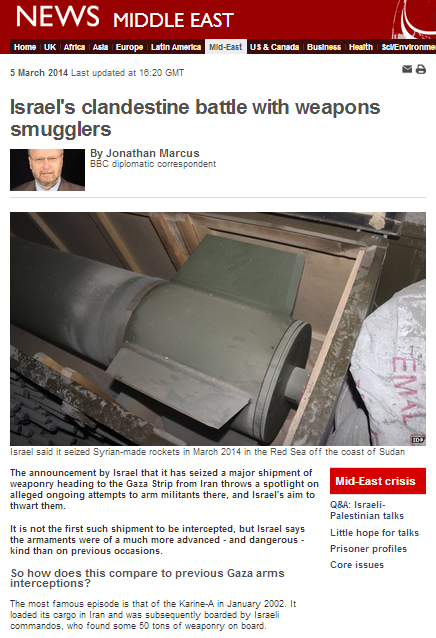 On March 5th an article by the BBC’s diplomatic correspondent Jonathan Marcus titled “Israel’s clandestine battle with weapons smugglers” appeared in the ‘Features & Analysis’ section of the BBC News website’s Middle East page. 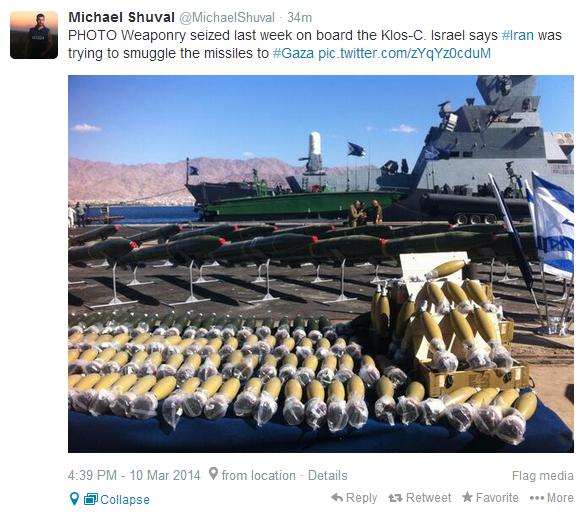 The article is obviously intended to provide audiences with background and context to the incident earlier on the same day in which Israeli naval forces seized a ship transporting Syrian-made missiles from Iran to Sudan, with their eventual destination being the Gaza Strip. “In the March 2014 case – unusually – the Israelis say that the weaponry actually originated in Syria from where it was flown to Tehran. It was then put on board the Klos-C at the Iranian port of Bandar Abbas. From there it went to Um Qasr in Iraq, before heading back out of the Gulf and round to the Red Sea where it was intercepted. However, the map inserted into the article does not accurately reflect the written information provided by Jonathan Marcus. Rather, it misleads readers by tracing an “intended route” for the ship which ends up in south Sinai, somewhere near Sharm el Sheikh. In fact, the vessel’s destination was Port Sudan. The same inaccurate map – which oddly states that it is sourced from the IDF – also appears in the additional BBC article on the subject, discussed here. March 7th: The inaccurate map has now been removed from both the above BBC reports. In the early afternoon of March 5th the IDF announced that an Iranian cargo ship sailing under the flag of Panama had been intercepted early that morning in the Red Sea by Israeli naval forces. Concealed among its legitimate cargo, the ship was also carrying Syrian-made 302mm missiles destined to be smuggled via Sudan and Sinai to the Gaza Strip. A video report on the background to the operation can be viewed here. The BBC’s initial coverage of the breaking news was garnished with revealing punctuation. The article subsequently underwent numerous changes. First came the version below, going under the same bizarrely punctuated title as the breaking news item and including liberal use of the standard BBC disclaimer “Israel says” as well as the statement below, which would be comical were it not such a damning indictment of the BBC’s failure to meet its commitment to accurately inform its audiences. “Almost fifty projectiles were fired towards Israel from the Gaza Strip last year, Israel says. Hamas denies that it has fired any rockets since a 2012 ceasefire agreement with Israel, and has blamed other groups such as Islamic Jihad. It then went on to cite anonymous “critics”, denying BBC audiences the opportunity to judge the merits of such a statement by clarifying the identity and political motivations of those “critics”. “Israel tightly controls its border with Gaza, restricting what is allowed in for what it says are reasons crucial to its security. It also maintains a naval blockade. Egypt blockades Gaza’s southern border. In this version of the report the number and time-scale of missiles fired from the Gaza Strip was amended and despite that information being in the public domain (even if the BBC does consistently fail to report it), the caveat “Israel says” appeared once again. Hamas denies that it has fired any rockets since a 2012 ceasefire agreement with Israel, with other militant groups in the Gaza Strip claiming responsibility. Once again the curious use of the phrase “in turn” appears, with the result that readers are encouraged to view the issue in terms of equivalence rather than cause and effect. 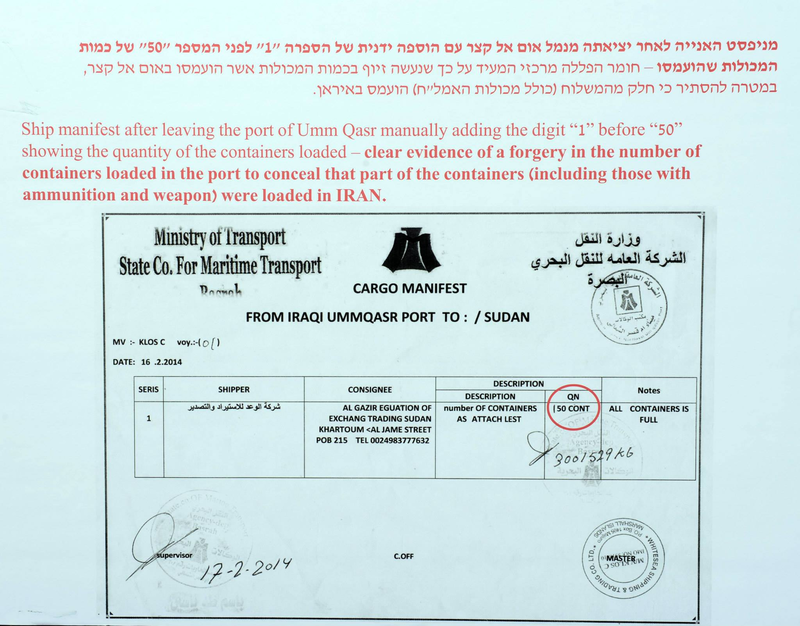 The later version of the report – with the amended title “Israel halts ‘weapons shipment from Iran’” – again included the same Hamas propaganda statement and citation of anonymous “critics”. In conclusion, BBC audiences are actively misled by this report in that they are encouraged to view Iran’s long and well documented history of arming and financing terrorist organisations as a debatable Israeli claim. The repetition of obviously ridiculous Hamas propaganda and citation of barely veiled accusations of war crimes from unidentified “critics” does nothing to lend ‘balance’ or ‘impartiality’ to the article and distracts from the actual subject matter. The deliberately equivocal presentation of the actions of terrorist organisations in the Gaza Strip and the responses of the armed forces of a nation protecting its citizens from that terrorist activity is clearly politically motivated. What should have been a very straightforward story to report has been rendered absurd by the BBC’s self-censorship and the insertion of faux ‘balance’. The end result of that inability to report in an objective and pertinent manner is that BBC audiences are distracted by the report’s ‘smoke and mirrors’ focus on the Gaza Strip at the expense of the provision of accurate information on this latest incident of provision of lethal weaponry to internationally designated terrorist organisations – and the ensuing destabilisation of the region – by the Syrian regime and Iran, even whilst negotiations with the P5+1 on the issue of the latter’s nuclear programme go on.